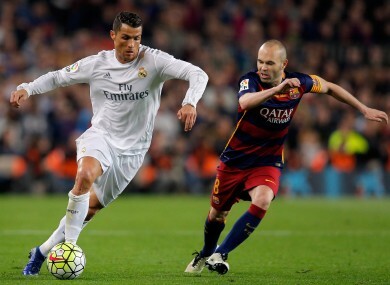 Barcelona’s meeting with Real Madrid this Saturday afternoon won’t be shown live on television in Ireland or Britain. Cristiano Ronaldo and Andres Iniesta. FOR THE FIRST time this season, Spain’s big two Barcelona and Real Madrid lock horns on Saturday afternoon. El Clasico is the biggest game in world football and attracts an estimated 400-500 million viewers globally each time they meet. Reigning La Liga champions Barca — currently trailing their arch rivals by six points — host the current Champions League holders at the Nou Camp, but it won’t be shown live on television. That 3.15pm (GMT) kick-off time was chosen in a bid to maximise global audienace, but under UK laws, broadcasting live football between 2.45pm and 5.15pm on Saturday is illegal as a measure aimed at enticing supporters to attend grounds around Britain. The ban has become increasingly outdated in recent years with the growth in popularity of online streaming as well as matches kicking off at times other than the traditional 3pm and on other days of the week. Sky Sports have the rights for La Liga in this part of the world, but will only be airing deferred coverage from 5.15pm on Sky Sports 2. As the blackout doesn’t apply in Ireland, viewers here have been able to watch a 3pm Saturday game on Sky Sports 5 since the start of the season. Many hoped El Clasico might be available that channel but a spokesperson from Sky Ireland confirmed to The42 that Sky Sports 5 is broadcasting Watford’s trip to West Brom. It won’t be a problem for everyone as there are plenty of illegal streams out there if you go looking plus betting companies such as Betfair and Paddy Power will provide live footage on their websites, which you need to have an account to watch. But the news is likely to cause some frustration for those hoping to watch two of the best teams in the world the old-fashioned way. Email “There's a TV blackout on the first El Clasico of the season this weekend”. Feedback on “There's a TV blackout on the first El Clasico of the season this weekend”.